Although it can be hard to pick, when people ask what my favorite dish to prepare is, "pasta" is usually what I think of first. Over the years, I've picked up a number of techniques that can make almost any pasta dish better. 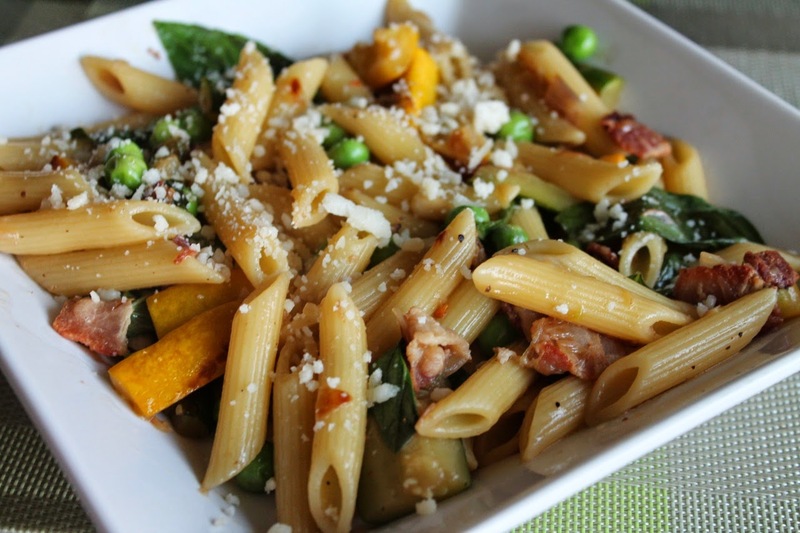 Below are my 10 tips for great pasta, most of which are embodied by the accompanying recipe for penn with bacon, zucchini and peas, a great summertime pasta. 1. Undercook the pasta by about a minute; finish it in the sauce. Perfectly cooked pasta is "al dente"--cooked through but still a little chewy. Cooking pasta in its sauce helps unite the flavors between pasta and sauce, however, it also means the pasta continues to cook. So if you cook pasta al dente and then add it to still-cooking sauce, the pasta will overcook. The solution is simple: undercook the pasta by about a minute then add it to the sauce to cook for its final minute. Not only does the pasta pick up flavors of the sauce, it's perfectly cooked. Undercooked pasta will be very chewy, almost crunchy, and edible, but definitely in need of longer cooking. 2. Use shallots, in place of garlic, to provide subtle pungency that won't overwhelm the vegetables. I love cooking with garlic in pasta, but in the summer, when I want the fresh vegetables to shine, I sometimes replace garlic with shallots, a happy medium between the pungency of garlic and the sweetness of onions. Shallots come in various sizes. When recipes call for 1, that's usually about 2 tablespoons minced. 3. Let vegetables sit undisturbed for 3-4 minutes at a time to promote browning. After sauteing the aromatics--i.e. some combination of garlic, shallots, onions, sometimes celery and/or carrots--other vegetables are added the dish. If you start stirring them immediately, they will cook more evenly, however, letting them sit undisturbed will allow them to brown a bit, adding flavor. Leave them just a couple minutes, then stir and leave another couple minutes, browning multiple sides. 4. Deglaze the pan with dry vermouth. When recipes say to "deglaze," they mean to add a liquid to a hot pan that food has been browning in. The liquid cleans off the browned bits, incorporating them into a sauce. We often have dry vermouth in the fridge, usually as the result of a purchase for martinis. But we don't drink martinis that often, so the vermouth just sits there. Pasta sauce is a great way to use it up. It works just as well as white wine to add a little acidity and wine flavor to the sauce. 5. A pinch of red chili pepper flakes adds just enough heat. I like my pasta with just a touch of heat. Adding red chili pepper flakes to a pasta sauce distributes that hotness evenly throughout the sauce, giving it just enough bite. Freshly ground black pepper, in contrast, should be added at the end, since cooking makes black pepper less flavorful. 6. A dash of nutmeg adds a hint of spice. Most people associate nutmeg with baked goods like pies, but it is a wonderful spice to add to savory foods. Just a dash is a welcome component of a pasta dish. I find it's particularly good with tomatoes. 7. Reserve pasta cooking water to make sauce. As pasta boils, it leaches starch into the cooking water, which means this water is not only pasta-flavored but also can help thicken pasta sauce as a lower-fat alternative to butter or cream. Dip a Pyrex measuring cup into the pasta water to reserve about a cup just before draining the pasta, then add this "pasta cooking water" to your sauce. This works especially well to pull together a chunky sauce. 8. Use butter near the end to add richness. Sure, you can sauté pasta sauce ingredients in butter, but olive oil works just as well. To still get that buttery richness, stir a little butter in the sauce right at the end. 9. Stir in toasted nuts for crunchy texture. Pasta and its sauce ingredients tend to be mostly chewy, so tossing in some toasted nuts (or seeds) adds a little textural variety to a dish. I love toasted walnuts or pecans in particular for pasta. 10. Stir in fresh herbs at the end to wilt slightly. A sprinkle of fresh herbs on pasta looks pretty and adds bright flavor, but to incorporate herbal flavor into the sauce more, I suggest adding it near the end of cooking, especially for something like basil or fresh mint. 1. Bring a large pot of salted water to boil. Add pasta and cook 1 minute less than package directions for al dente. Reserve 1 cup of the pasta's cooking water, then drain the pasta and set aside. 2. Heat a small frying pan over medium-low heat. Add pine nuts and toast until fragrant and lightly browned, about 5 minutes, shaking the pan frequently. Set aside when browned. 3. Heat a large sauté pan over medium heat. Add the bacon and cook until browned and crisp. Remove bacon with a slotted spoon and transfer to a paper-towel-lined plate. Drain off the bacon fat. 4. Heat olive oil in the sauté pan. Add the shallots, season with salt and sauté a few minutes until softened, then add the zucchini and season with a dash of nutmeg and a pinch of red chili pepper flakes. Sauté for about 10-12 minutes until the vegetables start to brown, leaving the vegetables undisturbed for a few minutes between stirring. 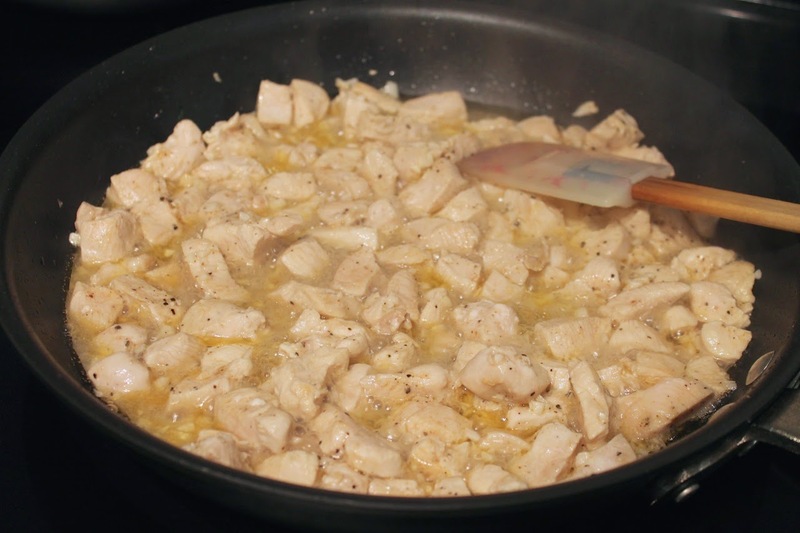 Add dry vermouth to the pan and stir with a wooden spoon to remove any browned bits from the pan. Stir in the fresh peas, reserved pasta cooking water and partially cooked pasta. Taste to pasta to ensure it has cooked to the desired doneness (i.e. al dente--chewy but cooked through). After about a minute, stir in the toasted pine nuts, cooked bacon, butter and basil. Serve pasta in shallow bowls topped with grated parmesan cheese. Washington Post: “Rethinking Dining Value: Eating at Restaurants Shouldn’t Be Only About Volume,” by Tim Carman. Carman, who writes the Post’s $20 Diner column, considers the notion of “value” when it comes to eating out, teasing out Americans’ predilection to value quantity over quality in judging whether they’re satisfied with a restaurant experience. It reminded me my recent review of a restaurant that serves very good food, but for which I faulted a bit when it came to providing “value,” given that I didn’t think the quality was quite a match for its high price. Washington Post: “Vodka, the Disraeli of Spirits,” by M. Carrie Allan. I admit it. I’ve become an anti-vodka snob. 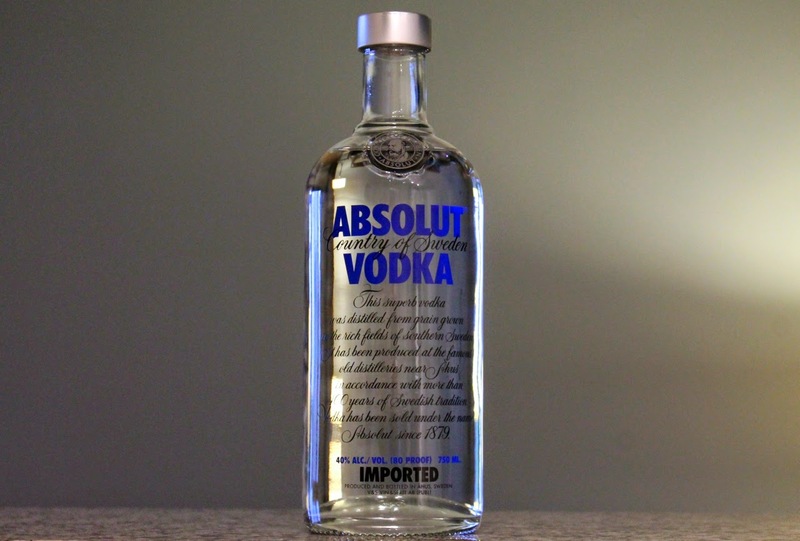 That barely used bottle of Absolut pictured above? It’s years old. And there are far fewer cocktails on my site made with vodka than those made with gin, rum or tequila. I’m not alone either, as Allan notes it has become maligned in craft-cocktail circles, despite still selling strong to the general public. Yet, she makes a good argument for why vodka, basically a blank canvas, is the ideal base spirit for showcasing other flavors. New York Times: “Hold the Regret? Fast Food Seeks Virtuous Side,” by Julia Moskin. With profits from restaurant chains like Chipotle and Sweetgreen that sell better quality, healthier fare, Moskin examines the state of this so-called “farm to counter” movement and its impact on the fast food industry. New York Times: “Chefs Move Beyond New York,” by Rebecca Flint Marx. In a move that’s good news for eaters everywhere (except maybe New York, but they already have enough good options), chefs training in famous New York establishments are increasingly leaving the Big Apple when they depart those posts to open restaurants in other cities. Buzzfeed: “46 Life-Changing Baking Hacks Everyone Needs To Know,” by Jessica Probus. Chris gets credit for finding this one, a great list of tips by Probus, some of which I already knew but quite a few I didn’t, like the first tip: use a wet finger to retrieve eggshell bits from a bowl of cracked eggs. If that works, it will mean an end to chasing those suckers around the bowl with two spoons. It happened with wine and now possibly with cheese: European producers are pushing to have certain names of cheese considered generic in the United States apply only to cheeses produced in specific European regions, cheeses like parmigiano-reggiano (parmesan in the U.S.), feta and gorgonzola. Soon that tall green can might contain “parmesan-like cheese” (some think it already does). A fun visual from Eater, celebrating all those dishes we’re all getting tired of at this point (kale Caesar, truffled potatoes, chicken for two, etc.). Eater: “23 Eye-Opening Charts of Major Food Trends,” by Daniela Galarza. Here’s another great story of visuals: graphs analyzing various food trends based on Yelp data of key words in user reviews. WTOP: “5,000 square feet of vegan food: A reflection of D.C.'s changing taste buds?,” by Sophie Ho. I get it, not everyone likes bacon as much as I do. And some people don’t eat any meat at all, or cheese, or butter. They’re called vegans! And they’re about to get a restaurant in downtown D.C. that will allow them the freedom to order something other than the plate of roasted vegetables at the bottom of the dinner menu. Lavandou closes. Pulpo closes. Dino closes (or rather moves to Shaw). And (sniff) Palena closes. Things have been looking grim for fine dining in Upper Northwest D.C., particularly Cleveland Park, where a series of closures means there are currently four vacant restaurant store-fronts in the neighborhood. 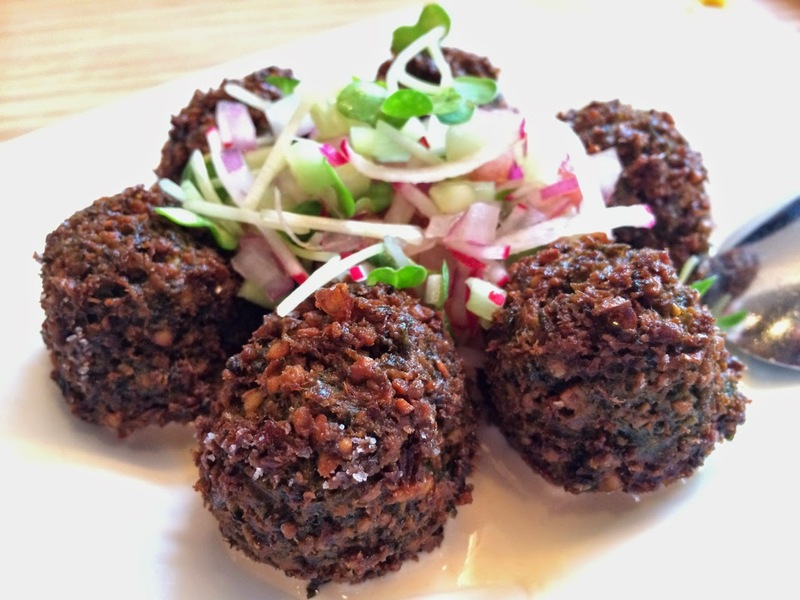 One could conclude that, with all the recent attention to new restaurants around 14th Street, Shaw and H Street NE, there is no reason to venture into this part of town for food. But the conclusion that dining in Upper Northwest D.C. is dead is quickly proven false by the phenomenally good Macon Bistro & Larder. Judging by the always-crowded dining room, this casual Southern-with-French-influences restaurant was exactly what the area needed. Located in the Chevy Chase Arcade, a historic building of shops just south of the Maryland border, Macon isn't without restaurant neighbors, but it is far and away the best of the cluster in Chevy Chase, D.C., representing an infusion of quality cooking and service almost without parallel for this sector of the city. In fact, given how much attention other neighborhoods are getting for their new restaurants, it's shocking (in a good way), that Macon's owners decided to open their business where they did. I, and other area residents, are all the more grateful for it. Macon's swanky charm and energetic vibe are immmediately apparent upon entering the space. It's more bistro than larder, painted in cool shades of gray with olive accents that recede against artful photos and posters, including a map of sorts illustrating Macon's grounding in Macon, Georgia and Mâcon, France. There's a healthy buzz among the patrons that fill the dining room and spill out onto the Connecticut Avenue sidewalk, but the restaurant is never too loud for comfortable conversation. Dinner starts with a delightful amusé, currently sour pickled cauliflower with cheese coins, crunchy little cheese biscuits like gourmet versions of cheese fish. 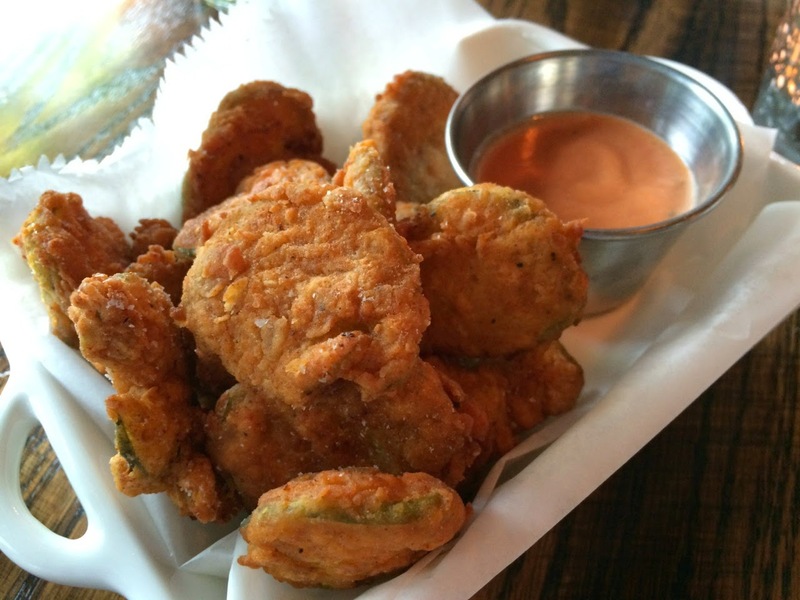 Our server's suggestion to choose a snack to nibble on while we make our menu selections leads us to a quickly devoured plate of fried pickles. The cukes' spicy breading is perfect for soaking up the cumin-spiced tomato aioli. All of these early treats taste great with a couple of cocktails, such as Water Lillets, a sumery concoction of gin and Lillet Blanc with the refreshing punch of grapefruit. We haven't even gotten to the meal proper yet, and already we could tell how well chef Tony Brown has married Southern and French tastes. But the next dish is all Southern, and it's a must-have. Macon's fried green tomatoes are extraordinarily good. 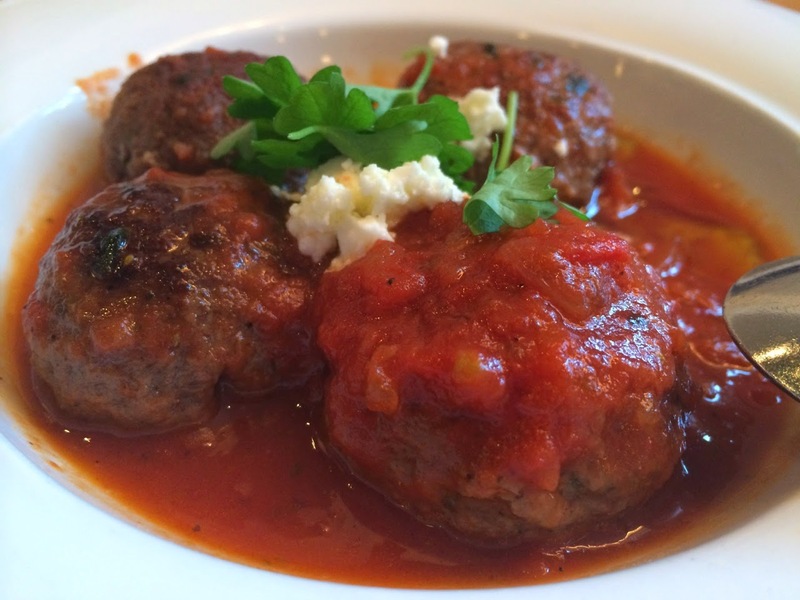 If you've never tried this classic, you may not want anyone else's version. 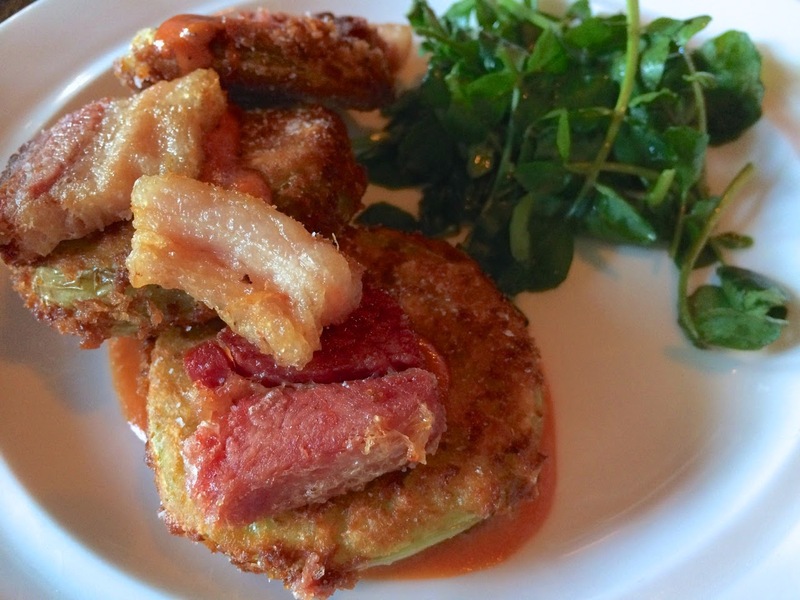 At Macon, thick slices of warm, tart green tomatoes arrive encased in a crisp, salty fried breading and served with generous chunks of smoky pork belly, spicy tomato aioli (the same one that comes with the pickles) and a side of watercress. During our first visit, we liked all the food, but this was our favorite. 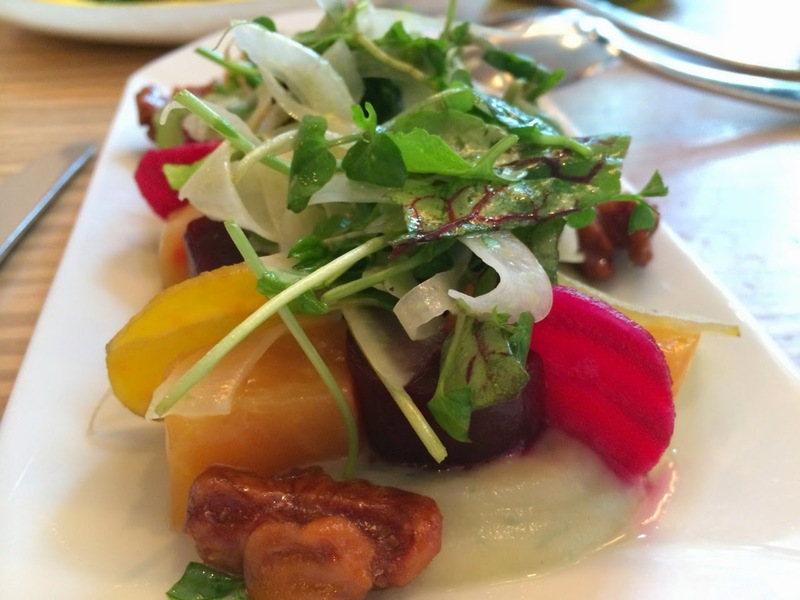 Another night we ordered a bibb lettuce salad with beets, radishes and buttermilk dressing. 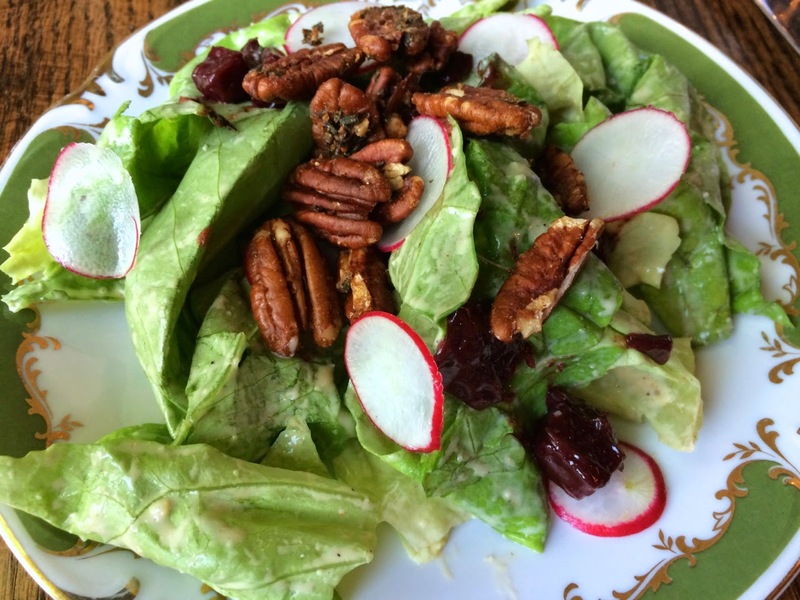 Although not as much a show-stopper as the fried green tomatoes, the salad is good and worth getting for the rosemary-spiced pecans that adorn it. It can be hard to choose an entree at Macon, since they all sound so good. 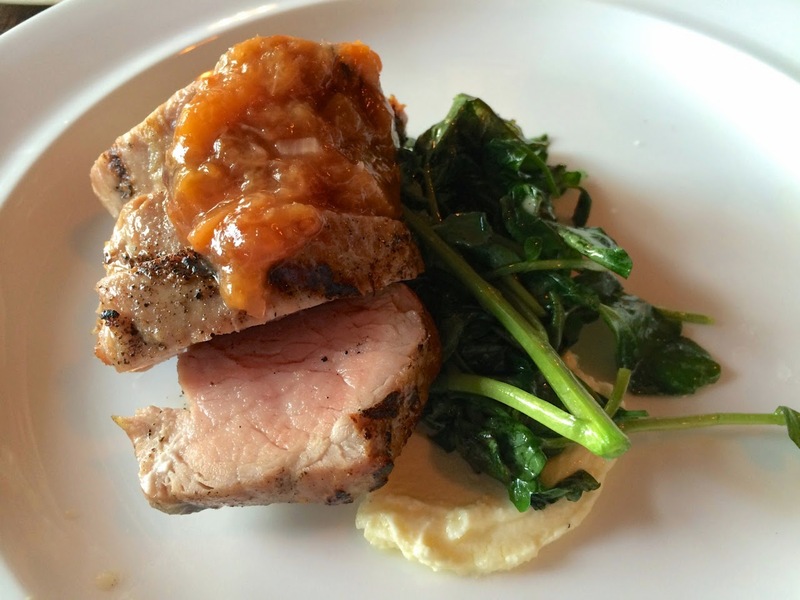 Roasted pork tenderloin rides the new wave of slightly less-cooked pork, arriving from the kitchen at a medium-rare to medium and garnished with spicy-sweet chipotle peach preserve that adds just enough zip without overpowering the meat. Given how often I see them around the dining room, the short ribs are a clear favorite. 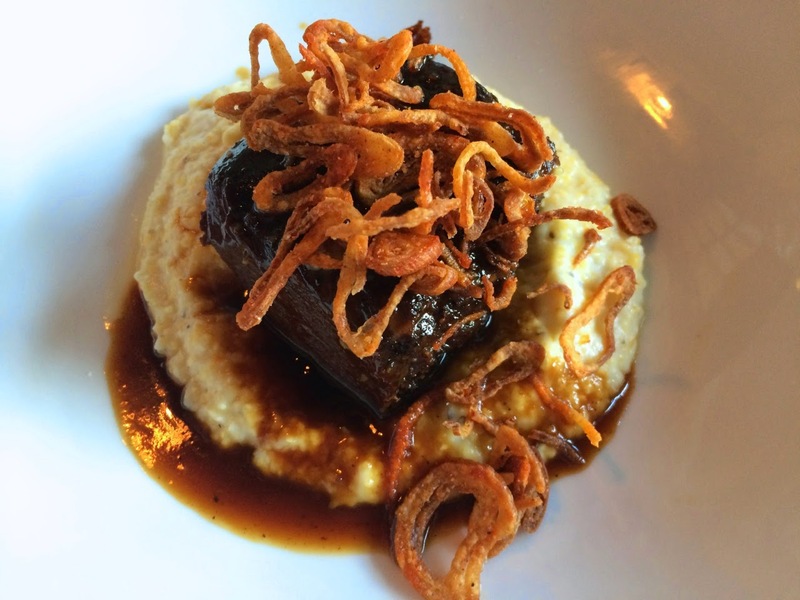 The tender, flavorful meat has a good sear to crisp its edges and is served over grits with a topping of crispy shallots. 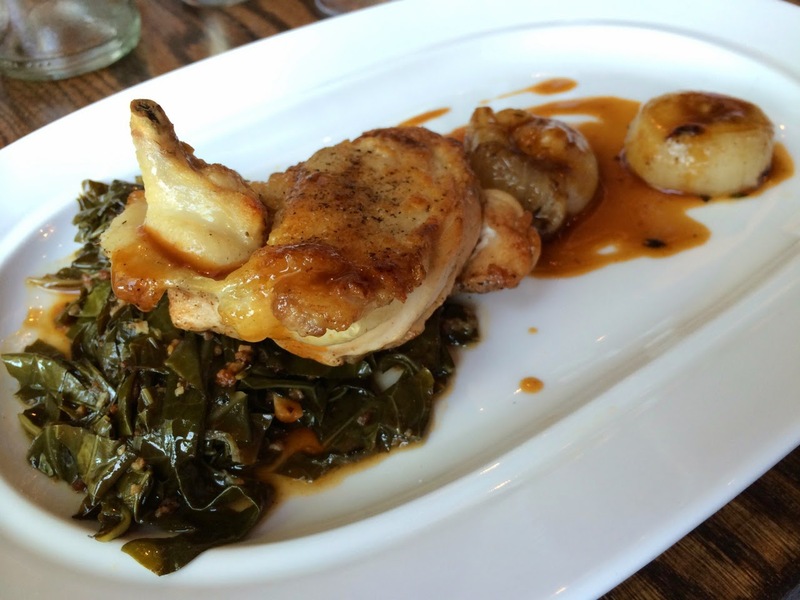 The moist and flavorful roasted chicken breast is also very good and is plated with bacony collard greens cooked just right. When our server told us the night's special was fried chicken and waffles, we instantly knew we had to have it. The Southern specialty was oh-so-satisfying. 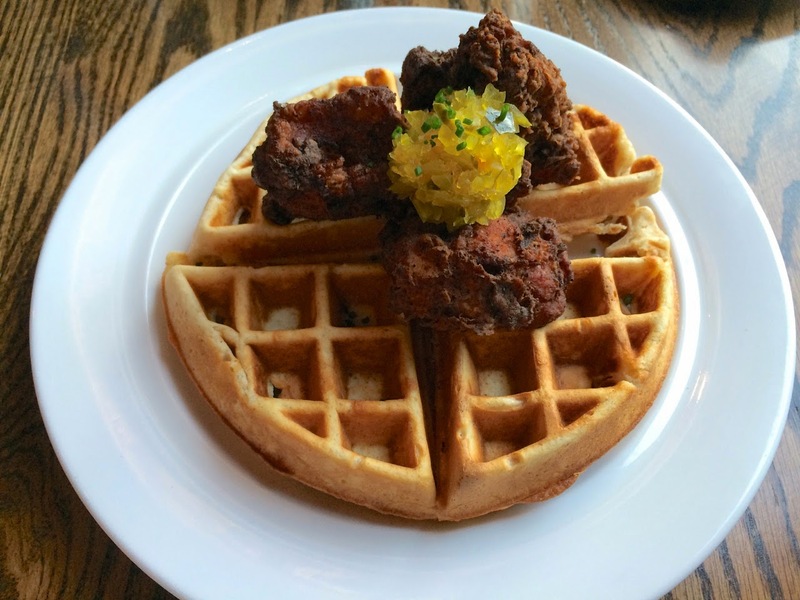 Boneless thigh meat is fried to a dark brown and served on a belgian waffle with honey-hot and bourbon-maple syrups. It's dishes like this that should entice you to get to Macon early; we had a 6:30 reservation and were the lucky last party to enjoy that evening's special. Macon's entree portions are not huge and the sides they come with are fairly small too. All the more reason to order some additional sides. 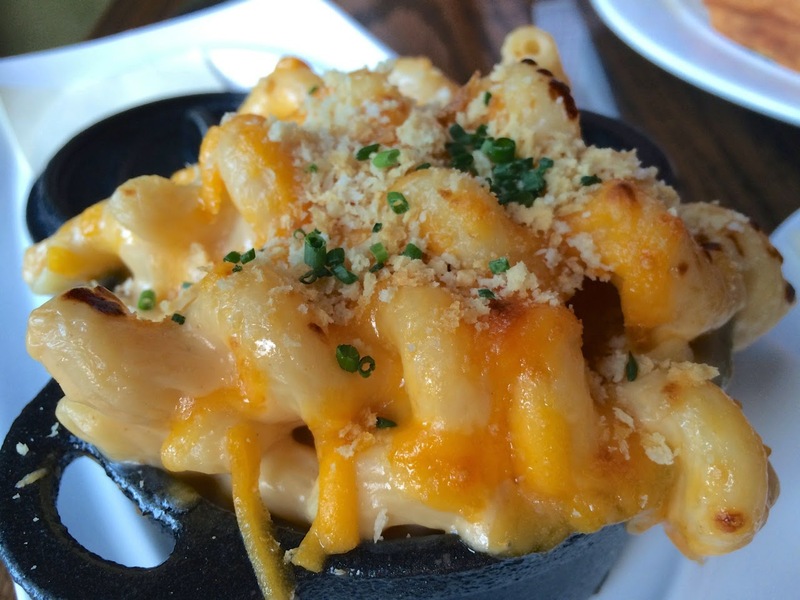 The 'Mac'-on cheese isn't a unique take on mac & cheese; it's just rich and satisfying the way you want it, made with spiral pasta, cheddar cheese sauce and a crunchy panko topping. 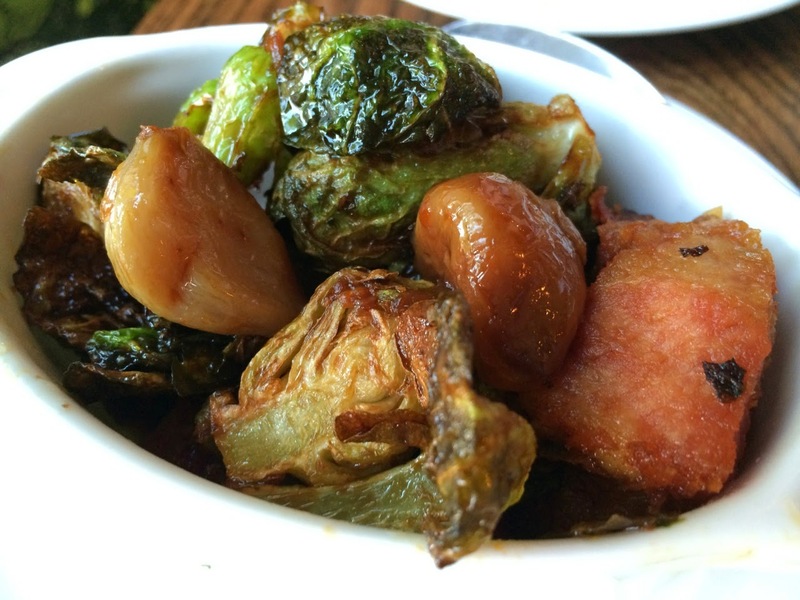 Roasted Brussels sprouts' bitter flavor is tempered with smoky bacon lardons, buttery roasted garlic and the earthy sweetness of black strap molasses. 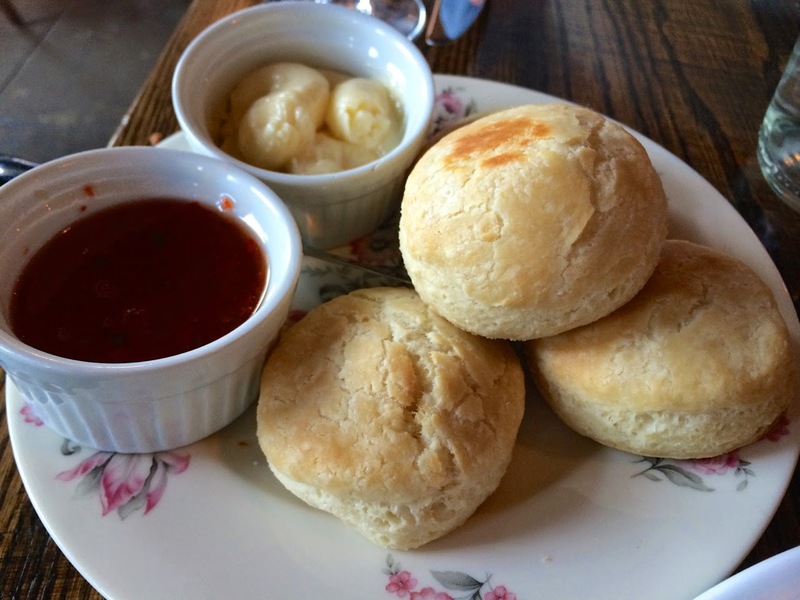 The house-made biscuits are also very good. I can't decide if I like them better smeared with honey-butter or pepper jelly. You won't have long to decide though, since your table will scarf these up quick. 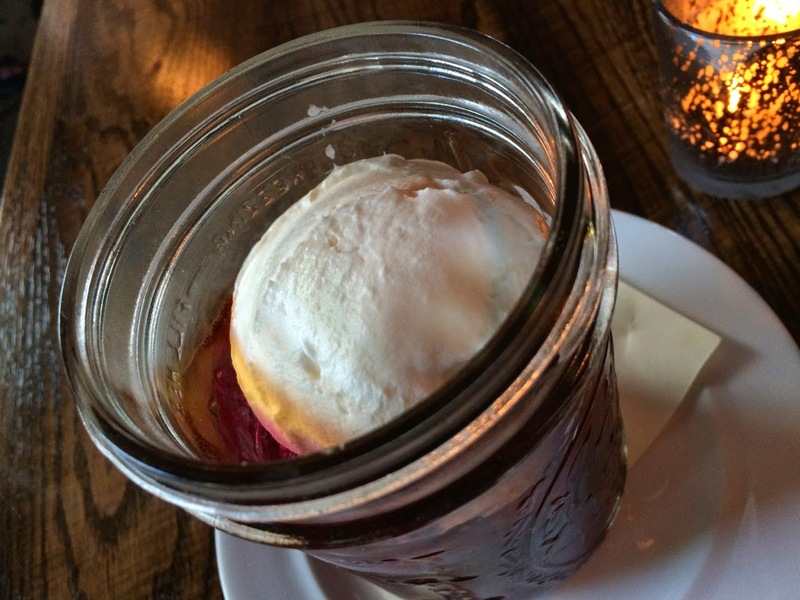 When it comes time for dessert, you might not have much room, but it would be a shame to pass up blackberry cobbler served in a mason jar warm but not too hot, making it enjoyable even on a hot summer evening with its cool topping of crème fraîche. If something cold is more to your liking, the coffee praline sundae hits the spot. 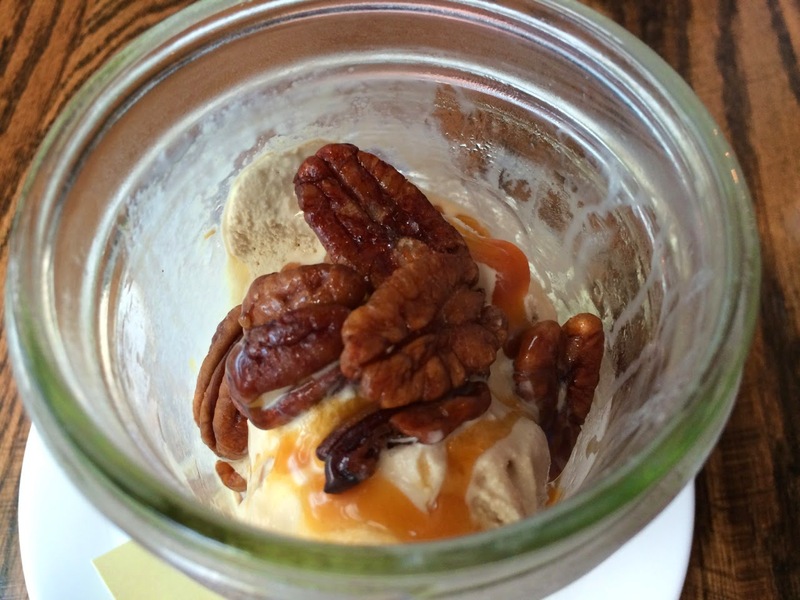 The strongly flavored coffee ice cream is decked out with bourbon-caramel and pecans. Before leaving, don't forget to snag one of their sea salt caramels, which are divine. Commercial caramels never taste burnt enough--these are almost smoky in their darkness with a pleasant amount of salt to balance the sweetness. You might even be tempted to buy more from the larder (the "larder" referring to the restaurant's small offering of pantry treats available for sale to take home, including the biscuits, pepper jelly and cheese coins). The service during both our visits to Macon was prompt, friendly and knowledgeable. During our first visit, our very-busy server always remembered to circle back with us, and made a point of getting an answer from the kitchen for me about the ingredients in one of our dishes. He also quickly righted a misstep that happened when our entrees arrived before our appetizers. On our second visit, our service was just as good, as our server, Allison, offered many good tips and paid particular attention to our wine needs, offering tastes of several by-the-bottle offerings before we settled on a sauvignon blanc--one of the better ones I've had. 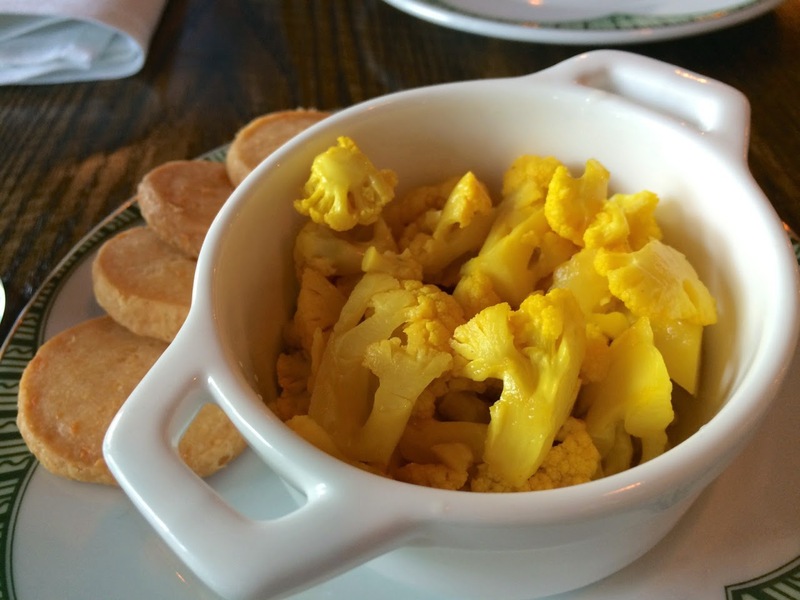 When Palena closed earlier this year, I wondered whether we'd find another restaurant close to our home that could become a favorite place for special occasions or any other time we just wanted really good food. Turns out, we didn't have to wait very long for Macon Bistro & Larder to come along and fill the gap. 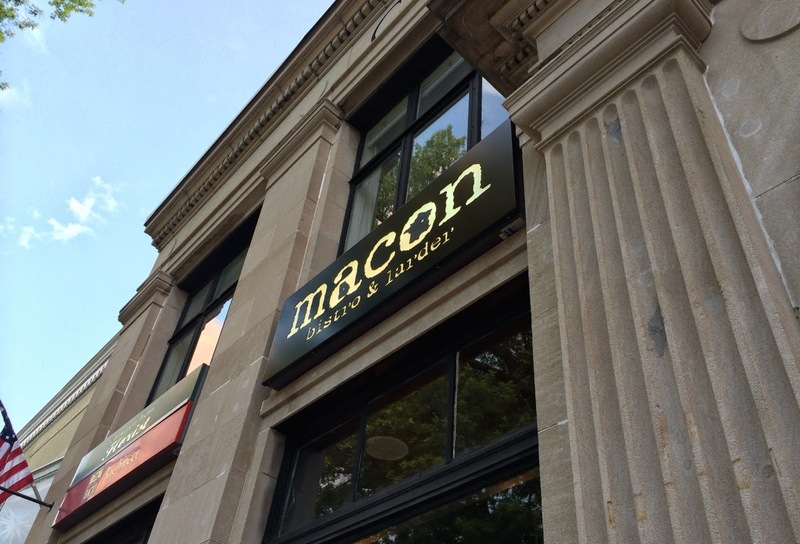 Macon Bistro & Larder, 5520 Connecticut Avenue NW (in the Chevy Chase Arcade between Livingston and Morrison Streets NW), Washington, D.C. (Chevy Chase). (202) 248-7807. Reservations: Open Table. I enjoy a good pasta dish any time of year, but when it's really hot outside, pasta salad is a good way to transform the usual hot fare into something cold but still quite satisfying. This pasta salad is a pretty classic combination of summer vegetables, herbs and cheese. Instead of roasting the red pepper, I sauteed it along with the zucchini and garlic. I've recently fallen for the authentic Greek feta cheese and recommend that in this dish, but feel free to use a domestic version if that's what's on hand. 1. Bring a large pot of salted water to boil. Cook pasta according to package directions for al dente. Drain pasta and set aside to cool. 2. Heat 2 tbsp. olive oil in a medium frying pan over medium heat. Add garlic and sauté until fragrant, about 30 seconds. 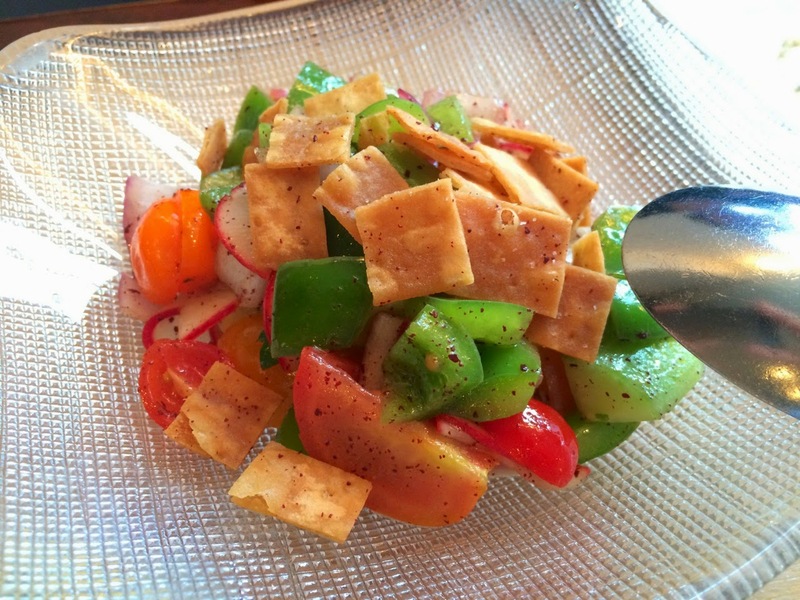 Add the red pepper and zucchini and season with salt, oregano and a sprinkle of red chili pepper flakes. Sauté until the vegetables are softened, about 10 minutes. Set aside to cool. 3. Heat a small frying pan over medium-low heat. Toast the pine nuts, shaking occasionally, until lightly browned, about 5-7 minutes. Set aside to cool. 4. 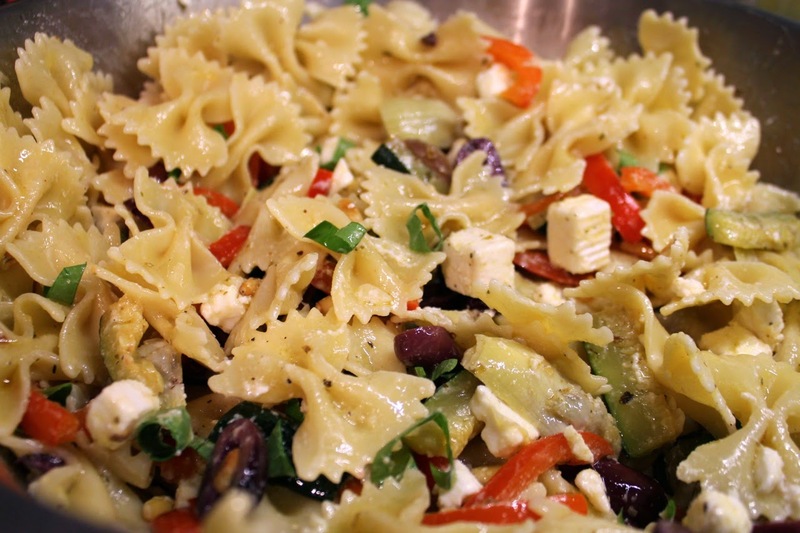 In a large bowl, combine the pasta, sautéed vegetables, pine nuts, artichoke hearts, olives, feta and basil. 5. Make the dressing: add the onion and salt to a glass measuring cup or bowl. Mash with a muddler or the back of a spoon until juicy. Add the vinegar, mustard and pepper and whisk together with a fork. Add the olive oil and whisk until emulsified. Pour over the salad and toss to combine. 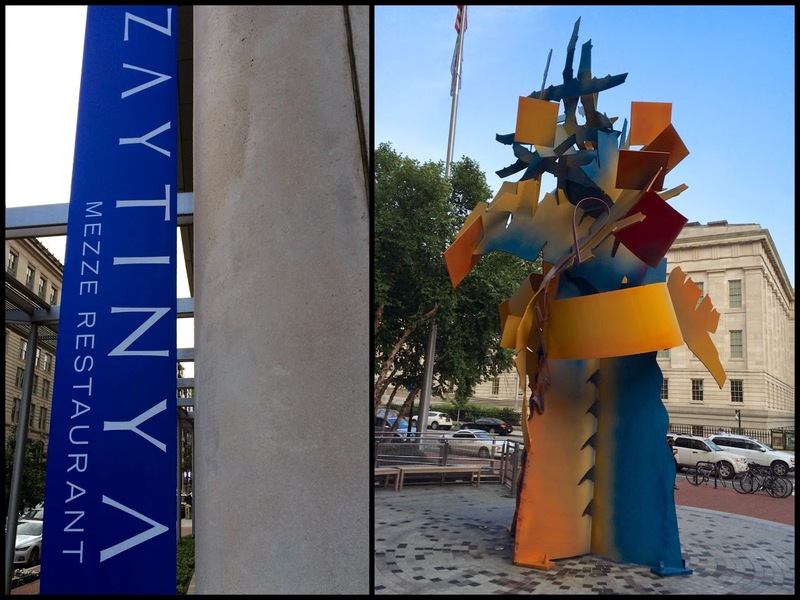 Last week was all about summer, including a stop by the Smithsonian American Indian Musuem's cafe, ideas for summer produce, food-related beach reads and the Beach Breeze, a good summer cocktail. I've been growing an herb garden this summer, so I've been writing about its progress and featuring lots of recipes with fresh herbs like basil, spearmint and parsley. 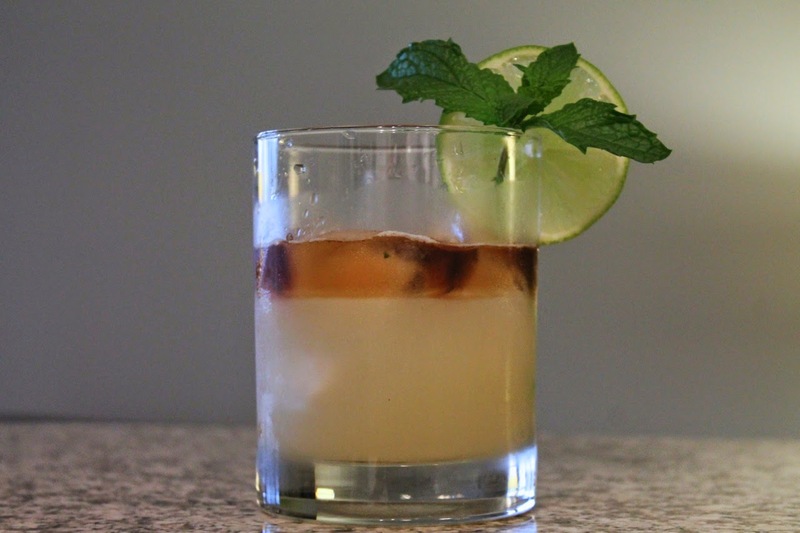 Summer Cocktail Week 2014 is chock-full of ideas for refreshing warm-weather drinks. I had a recent spate of Mexican posts, including recipes for tacos, an apple margarita and a guide to D.C.'s Mexican restaurants. Summer is for...lazy afternoons with cocktails. Who can argue with that? Whether you're at home on your balcony or deck or enjoying warm weather at a beach or lake, nothing beats a refreshing, cool drink at your side. This drink is loosely based on the Rainbow Beach Swizzle by Jesse Card. Card's version features more rum--four kinds in fact--plus pineapple juice. I dialed back the rum a bit, omitted the pineapple juice (for the sole reason that I had run out and didn't realize it) and added some ginger syrup. For more summer cocktail ideas, check out my recent Summer Cocktails Week. Add lime juice and mint leaves to a cocktail shaker and gently muddle the leaves. Add the rum, falernum and ginger syrup and fill the shaker with ice. Shake until cold then strain into a rocks glass filled with ice. Carefully float the blackstrap rum on top of the drink (it works well to slowly pour it over the back of a spoon). Garnish with mint spring and lime wheel. Summer is for...good beach reads. Or good reads wherever you find yourself on a nice day with a few hours to relax. These are the food-related books that I've either read, am reading or am otherwise interested in this summer. A Farm Dies Once a Year by Arlo Crawford. This beautifully written memoir details a season Crawford spent on his family's small Pennsylvania farm after abandoning his 9-to-5 life in Boston with girlfriend (now wife) in tow. Titling such a book with a reference to death might be an unexpected move, yet it's an apt title, referencing the powerful cycle of life-and-death that plays out on the farm each year as well as the murder of a neighbor that happened during Crawford's childhood that is a running thread through his story. I particularly enjoyed this book because the subject farm--New Morning Farm--is the one where I buy my produce every Saturday morning. Reading pages 204-212, which detail said Saturday morning but from the point of view of the market workers, was a real treat, giving me a deeper appreciation for the vegetables and fruits I have been buying there over the years. In fact, I draw a significant amount of inspiration from the wonderful produce I buy there (see this recipe, this recipe, this recipe, this recipe, this recipe, this recipe, this recipe and this recipe, for example). 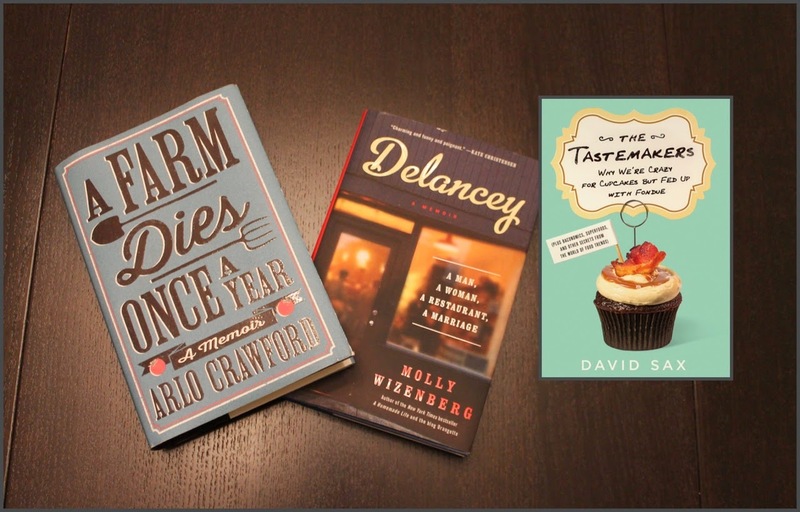 The Tastemakers: Why We're Crazy for Cupcakes but Fed Up with Fondue by David Sax. I've recently started reading Sax's insightful examination of food trends, which discusses not just what the trends are but the factors that bring them to prominence. He starts with the once-humble cupcake, formerly served mostly at elementary school birthday parties but now an adult indulgence churned out in endless varieties from high-end bakeries in every major city in the country. I can't wait to see what other trends he tackles. Delancey: A Man, a Woman, a Restaurant, a Marriage by Molly Wizenberg. The title of this memoir, Delancey, refers to the Seattle pizza restaurant Wizenberg started with her husband. When I mentioned to a coworker I was going to read this, she got excited, having discovered Wizenberg through her popular blog, Orangette. I'm only a little ways into the book, which is clearly about more than just the restaurant, but I'm already loving Wizenberg's warm, witty writing style. The Third Plate: Field Notes on the Future of Food by Dan Barber. Has Barber emerged as the most prominent voice in the farm-to-table movement? Quite possibly. With The Third Plate, the Blue Hill chef critiques that movement while imploring its followers and practitioners to move a step further. If you've read any of the recent interviews Barber's done to promote the book, it's clear what his bent is. Although I haven't yet read any it, it's been recommended to me and sounds like it would appeal to fans of books like those by author Michael Pollan. The Bar Book by Jeffrey Morgenthaler. This book I wrote about earlier this summer as part of my summer cocktails week. I thought I'd include it again though for cocktail fans. Unlike most cocktail books, this isn't just a collection of recipes, but rather an informative treatise on proper cocktail-making techniques, inter spliced with Morgethaler's stories about his experience in the bartending industry. One of the few cocktail books that is quite an enjoyable cover-to-cover read. My By The Fire sundae has a lot of smoky flavors, but imagine if the ice cream itself were smoked--wouldn't that be something?! The Daily Meal: “How ‘Reality’ TV Cooking Shows Get It Wrong,” by Jacques Pepin. I love food. And I love television. So it might surprise you to learn that I don’t really love food television. While I’ve been known to watch Top Chef and the occasional demonstration cooking show, I find most food-driven reality TV to be rather ridiculous. Leave it to legendary chef Jacques Pepin to write a thoughtful take-down of the industry. When he says the kitchens depicted on such shows are fiction, you know he knows what he’s talking about. 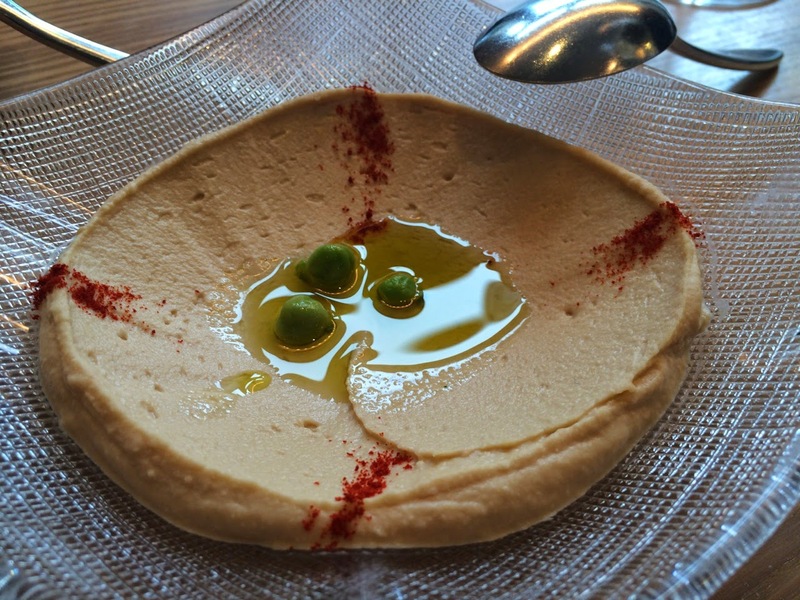 Washington Post: “What It’s Like When Michelle Obama Shows Up To The Restaurant Where You’re Dining,” by Tom Sietsema. A fun treat for D.C. restaurant-goers since the Obamas’ arrival in 2008 is that the President and First Lady often like to dine out. Chris and I just missed them at Oyamel recently—they arrived minutes after we’d left. So what would it be like to dine with Mrs. Obama at a nearby table? The Post’s restaurant critic had just such an experience recently. Washington Post: “Plate Lab: Parmigiano ‘Gelato’ Is Magic Simple Enough to Make at Home,” By Joe Yonan. Savory cheese gelato? Why not. 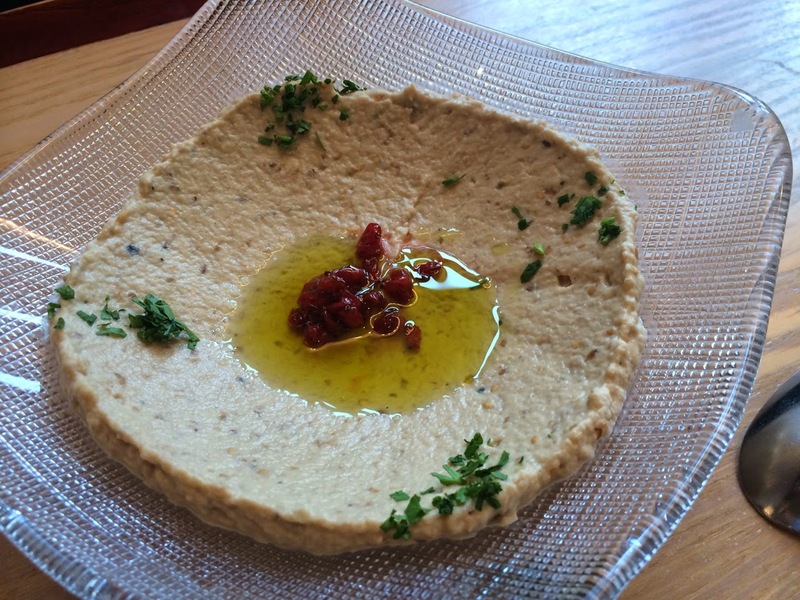 For a recent Plate Lab column, Yonan examined the recipe behind Osteria Morini’s unusual crostino. Best of all, the relatively simple recipe has only five ingredients. Serious Eats: “The Best Sweet Use for Your Smoker? Smoked Ice Cream,” by Max Falkowitz. Smoked flavors have been increasingly popular in recent years. So I shouldn’t be surprised that they now show up in ice cream. I’d really like to try some. 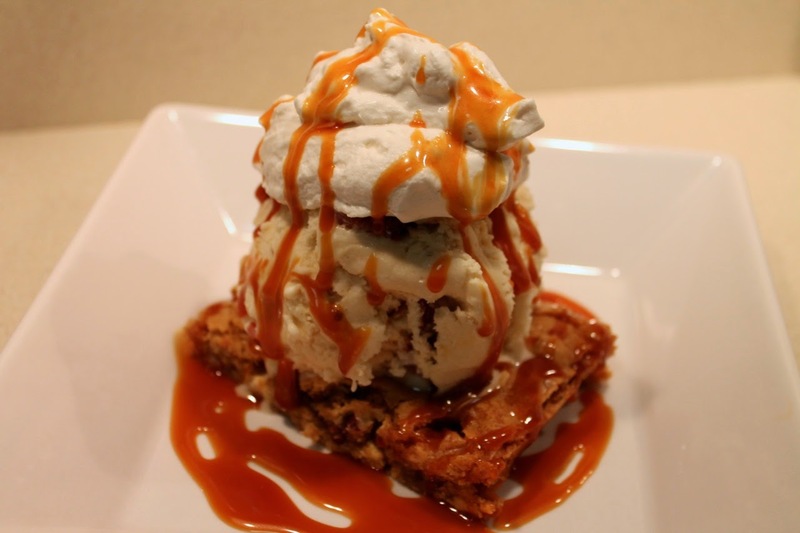 I’ve made a smoky sundae before with a brown-butter blondie, maple-bacon ice cream and smoky whipped cream that was quite decadent. Los Angeles Times: “Controversial website puts a price on table reservations,” by Dashiell Young-Saver. Much news was made this last week about web-based services that scarf up hard-to-get reservations and then sell them. Effectively turning something free but coveted into a monetized commodity. Young-Saver writes that one such company, Reservation Hop, has apparently shut down over the backlash against it. I’m glad. I think it’s a terrible direction for dining-out to go. I’ve said that I’m not a fan of restaurants that don’t take reservations, and I disagree that reservations are somehow elitist since—barring services like these—they provide anyone the chance to snag a table. But bringing in third parties to start chargin diners for something that should be free could quickly become a race to the bottom. It would mean the end of reservations, and I don’t want to see that. New York Times: “Microwaved and Messy, Not Stirred,” by Robert Simonson. There is so much seriousness when it comes to cocktail-making these days, that it’s refreshing to read Simonson’s story about Joe & Misses Doe, the East Village bar churning out inventive, whimsical drinks, like Three Sheets to the Watermelon. Business Insider, “11 Psychological Tricks Restaurants Use To Make You Spend More Money,” by Maggie Zhang. I’ve read before that there is a certain science to restaurant menu design. Zhang looks specifically at ways restaurants can optimize their menus so diners spend more. Eater: “Sriracha Factory Saga Blamed on Faulty Science,” by Khushbu Shah. Remember Srirachagate? Huy Fong Foods, the California-based producer of the popular Asian-style hot sauce, had to temporarily shut down after complaints from neighbors that odors from the factory where making them sick. The city dropped its case about the food company, but Shah unearths what will probably be the last chapter in the story: the rather flawed research the city did to make its case. Tomatoes. Tomatoes are my favorite summer produce because they have amazing complex flavor and because their year-round equivalent just doesn't hold a candle to the fresh summer variety. Buy a tomato in February and will have a ghostly white inside and a mealy texture. Summer tomatoes are vibrantly colored inside and out, juicy with a slightly firm texture. They are wonderful raw in salads, like the classic combination of tomato, mozzarella and basil or the slightly more complicated heirloom tomato panzanella. Lightly cooked, fresh tomatoes are perfect for pasta with fresh tomato sauce, broiled tomato and green garlic pasta or fresh tomato and oregano soup. Then there's roasting, which deepens tomato's amazing flavor. I do all kinds of things with roasted tomatoes, including risotto, gazpacho, panzanella, bruschetta, even cocktails. Sweet Corn. Sweet corn, which is the kind you get in the produce section, is perfect when just boiled and eaten off the cob. Still, there are other fun ways to enjoy it when it's sweetness peaks while in-season during summer. Looking for a good cooking project with a bit of challenge? Check out sweet corn agnolotti. What something simpler? Try corn risotto or soup. Corn is also good roasted and stuffed into enchiladas. 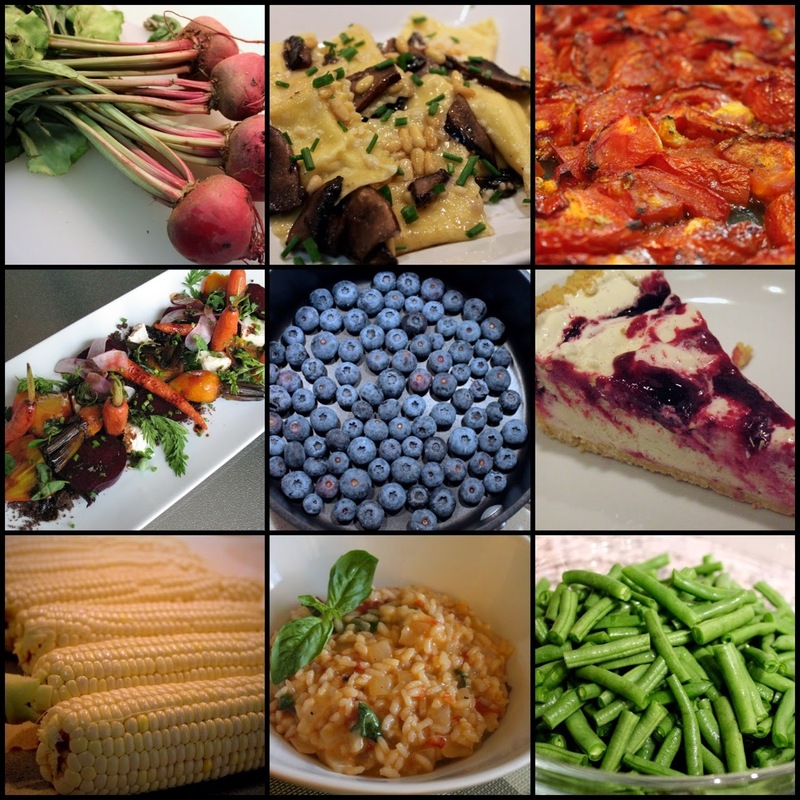 Check out last year's sweet corn week for additional recipes. Berries. Blackberries taste really good with corn, like this blackberry-vanilla ice cream pie with corn cookie crust, corn pancake with blackberry sauce or sweet corn ice cream with blackberries. Blackberries are also good in salad with cucumbers or in a cocktail (blackberry mint fizz). Similarly, blueberries are good in salad or dessert, like panna cotta. They're even good with salmon. Beans. Dried and canned beans are great anytime of year, but in the summer, it's nice to have fresh beans. Green beans of course, are easy to come by and taste great in recipes like sautéed green beans with baby leeks, garlic-ginger green beans and Mediterranean chicken salad. For something a little different, try fava beans, served in this recipe with shallot, mint and pecorino cheese. Beets. Beets are another item available not just in summer, but my farmers market has an excellent assortment of them this time of year, especially beets. they are wonderful roasted or boiled for salads, pasta with beet pesto, beet gnocchi, golden curry chicken salad, roasted beet and cottage cheese salad, and roasted beet and carrot salad. Herbs. Lastly, fresh herbs are abundant this time of year and taste great as an accent on just about any dish or the star player in a dish like spaghetti with parsley pesto. 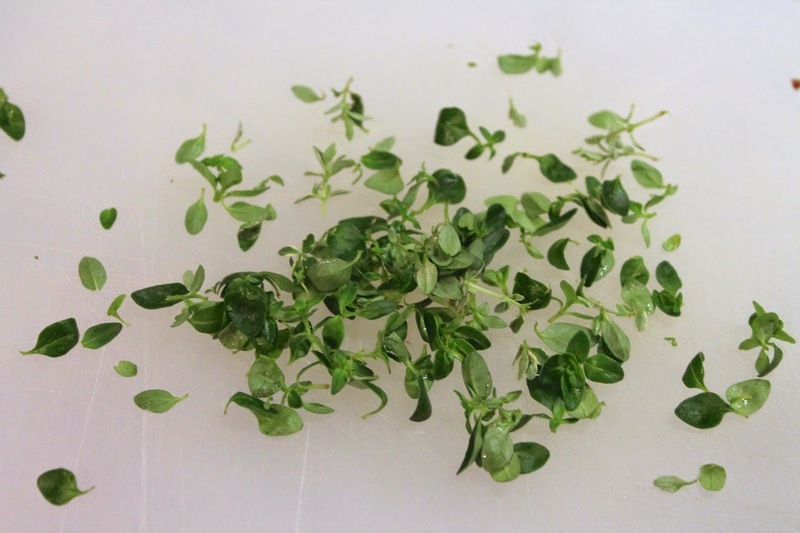 For lots of great fresh-herb recipes, check out this first post about my summer herb garden. Summer is for...travel, and a great many travelers find their way to my city, Washington, D.C. The National Mall, basically D.C.'s front lawn, is D.C.'s biggest tourist magnet, surrounded by the free-admission Smithsonian museums, the National Gallery of Art, the Capitol, White House and numerous monuments. Given the influx of camera-toting, souvenir-t-shirt-wearing visitors, locals tend to avoid the area unless they are out for a midday jog or ultimate frisbee game. 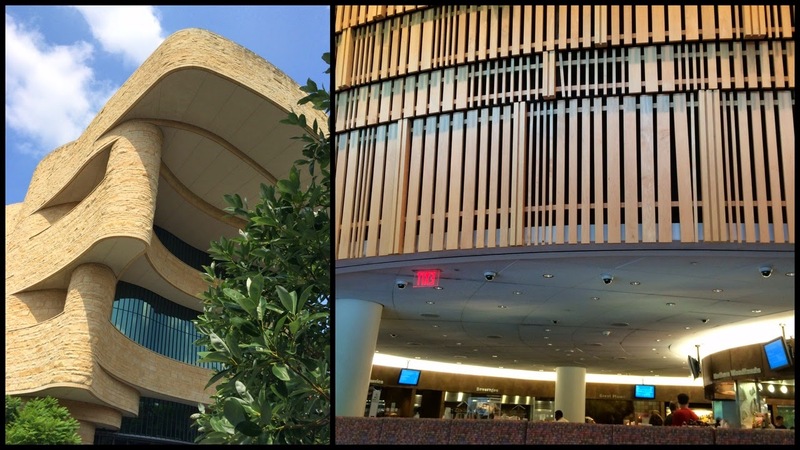 But when it comes to food, we all have to eat, and there's one place on the Mall I think both tourists and locals should get to know: the Mitsitam Native Foods Cafe in the Smithsonian National Museum of the American Indian. A museum cafeteria probably isn't where you'd go looking for haute cuisine. When I think of such places, I have a vision of a big yellow tray on which I might put a sandwich, salad and some fries--nothing particularly notable. At Mitsitam, you still get a yellow tray, but from there things get much more interesting. Most of the larger Smithsonian museums have their own cafes, either innocuous ones serving basics or food-court-style places with name-brand vendors. In contrast, Mitsitam Cafe serves the most remarkably creative and fresh cuisine I've ever seen coming out of a museum. If you're one of the 25 million annual visitors to the National Mall and find yourself in need of lunch, this is where you should go. The cafe is structured around five food stations serving dishes inspired by the cuisines of native cultures from five regions: the great plains, the Northern woodlands, the Northwest coast, Mesoamerica (i.e. Central America) and South America. Each station offers a few entrees, hot and cold sides and desserts. You're free to design your meal any way you like: choose selections all from one station or mix-and-match from several. The cafe's chef, Richard Hetzler, helped research and develop the restaurant's concept (that alone is a tip this a special place; how many museum cafes are run by executive chefs?). 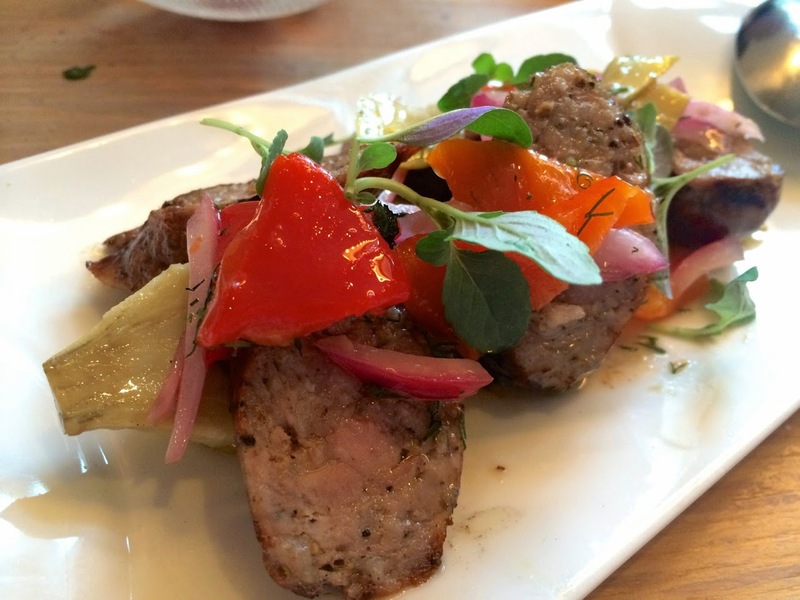 In addition to offering regional variety, Mitsitam's menu changes seasonally. Recently, the menu shifted from spring to summer (so some of the dishes I discuss below are no longer available, but this will still give you a feel for the types of food to expect). 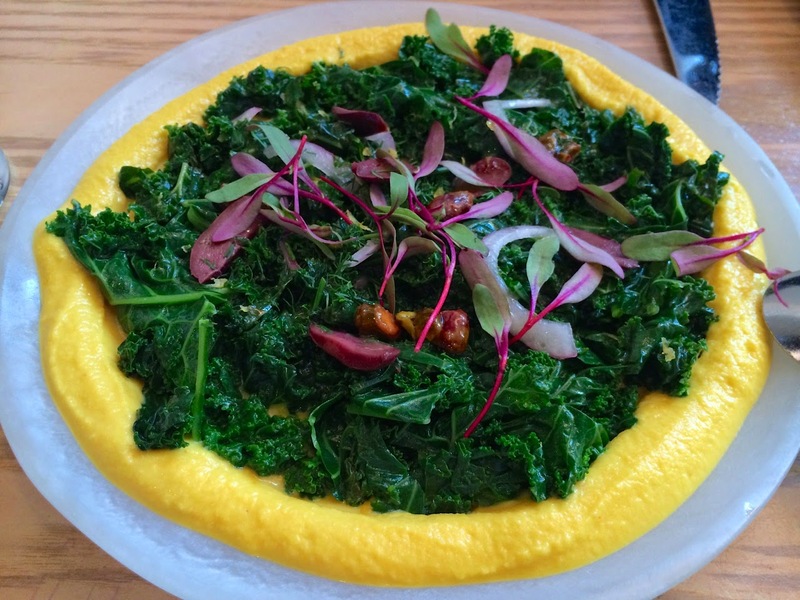 One of the greatest things about the offerings at Mitsitam is the variety of unusual, fresh ingredients. Fiddle heads, for example, is one of those hard-to-find ingredients you read about each spring but never see at the grocery store and rarely at the farmers market. Well, here are the little green fern tendrils, nestled within a salad caramelized pearl onions, hominy and aged sherry vinaigrette. 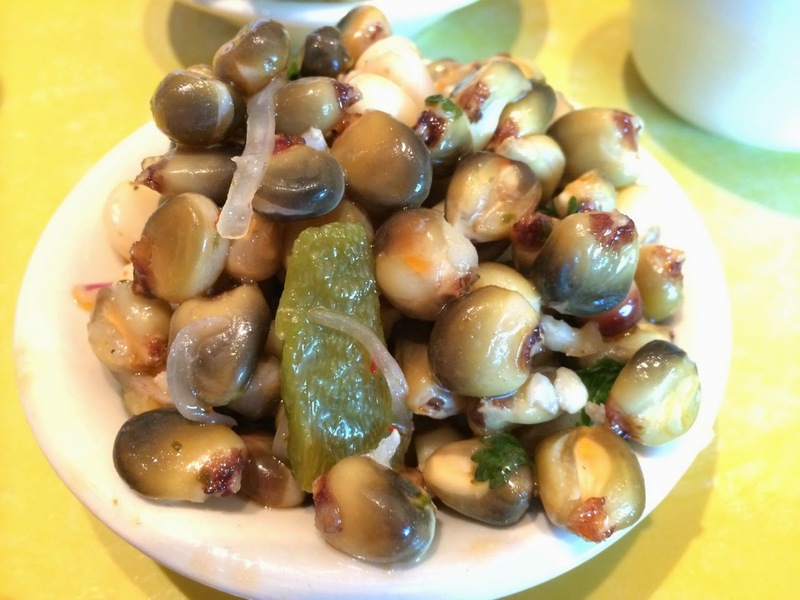 Speaking of hominy--another not-so-common vegetable--the grain also shows up braised in a tangy side with candied bacon and wild onions (in case you're wondering, hominy is just corn soaked in an alkali solution that causes the grain to puff up). Both the fiddle heads and hominy come from the Northwest Coast station, which features one of Mitsitam's best-known entrees, wild salmon grilled on a cedar plank. When I had it from the spring menu, it was served with a fresh horseradish relish, which complemented the nicely cooked fish without overwhelming it. The Northern Woodlands station offers wonderful soups. On offer now is a chilled corn and heirloom tomato soup that sounds really good. The tangy-sweet pickled beet soup with cherry compote and dried corn crumble was one the best things I've had at Mitsitam. The sides from this station can be hit-and-miss though. A wild rice and watercress salad was quite good, but a grilled spring squash salad was served with corn that proved hard to eat, as the corn was served still on the cob (how does one eat such corn in a salad? pick it out with your fingers even though it's coated in dressing? try to cut the kernels off--a tricky prospect with a table knife). 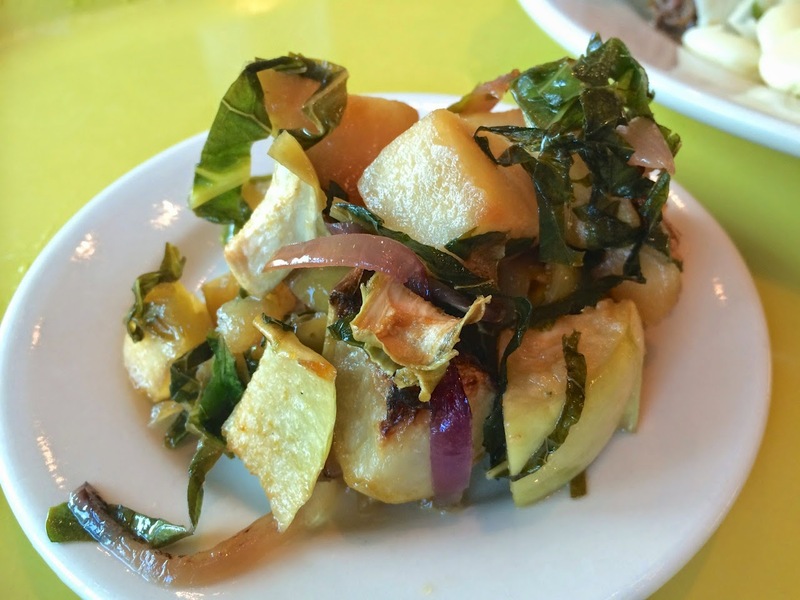 A recent side of roasted kohlrabi was beautifully flavored with apple and cider reduction, but struck me as undercooked, as the star vegetable was quite tough. 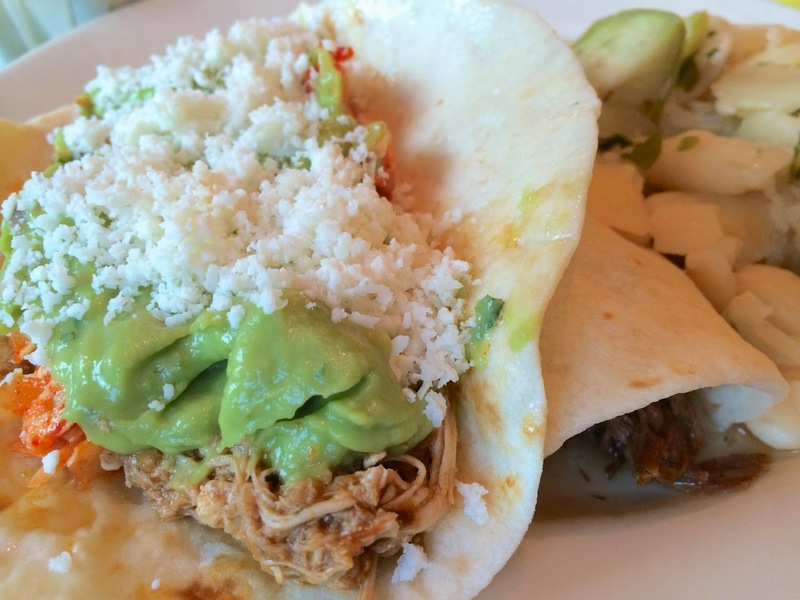 Another highlight are the tacos from the Mesoamerica station, which rotate with the season. On offer now are chicken with prickly pear mole and goat with plantain and poblano salsa. If you've never had goat, I say give it a try. The tender, shredded meat reminded me of braised beef and was my favorite of the two. Guacamole, crumbled cojita cheese and a selection of salsas are offered as garnish. I've never had coconut in a taco before, but the coconut-chili salsa was perfect with both meats. The line at the Great Plains station is always the longest. Probably because this is where you can get an Indian fry bread taco or a buffalo burger. Maybe if I return during non-tourist season, I'll give this station a try. 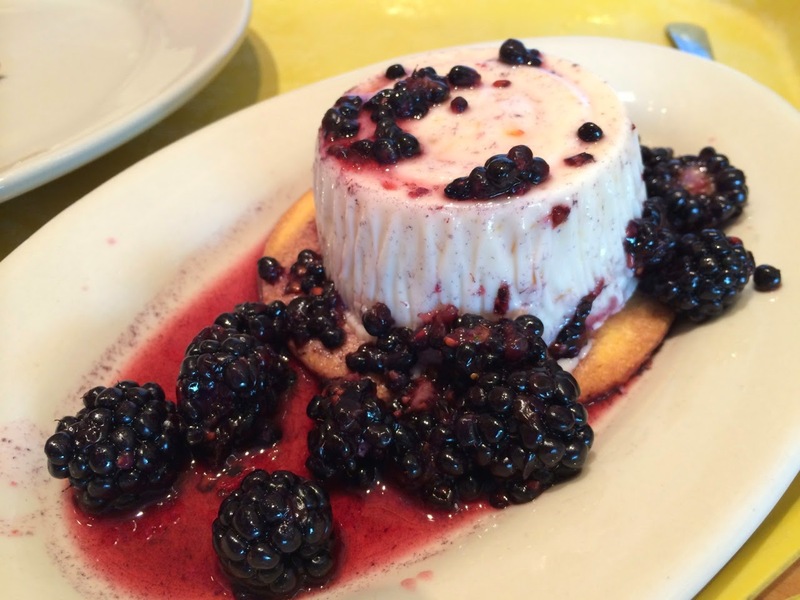 Corn custard with fresh blackberries is a simple, sweet way to end a meal. A potential drawback of Mitsitam, especially for families, is the price. The sourcing of this array of fresh ingredients surely doesn't come cheap, and the cost of entrees generally runs in the teens with some in the twenties. So lunch for two can easily hit $40 (discounts for federal employees and Smithsonian members help a little bit). 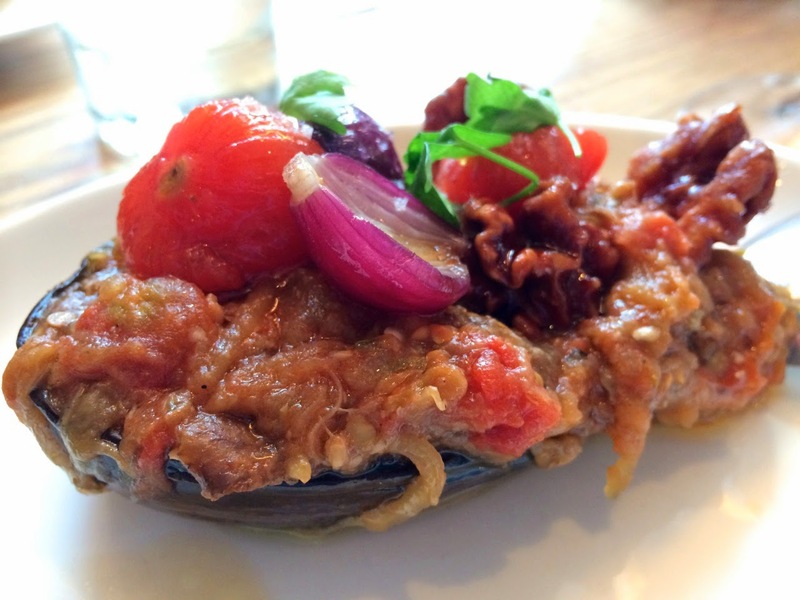 Still, if you're willing to splurge, you're in for a treat, and given the cuisine's connection to the subject-matter of the museum, it's a particularly tasty way to further experience American Indian culture. Mitsitam Native Foods Cafe, 4th Street and Independence Avenue SW (inside the Smithsonian National Museum of the American Indian). Museum phone: (202) 633-6644. Back in the day, I hardly remember ever eating a salad without croutons. I always wanted the crunchy little bread cubes flecked with herbs. The half-inch cubes were the most common, although I also loved the larger 1-inch size and even the round ones. 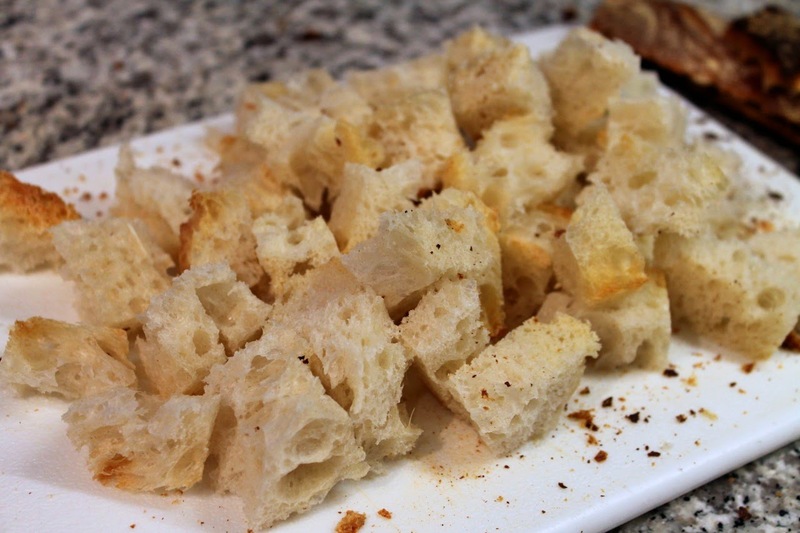 Being a carb, croutons have lost favor in salads outside of things like Caesar Salad where they are an essential ingredient (and there are even a lot of Caesar Salads without croutons these days, like this version with a parmesan crisp). 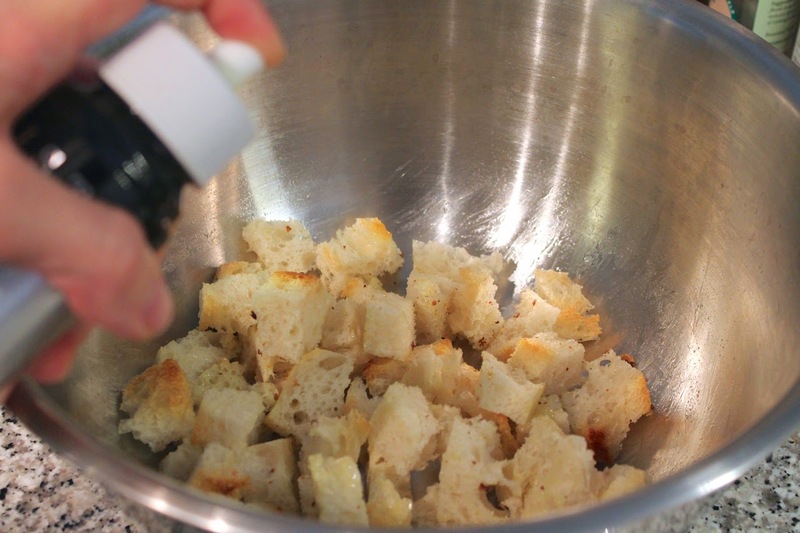 You can toss the bread cubes with a couple tablespoons of olive oil, but to coat them more evenly (and potentially use less oil), apply the olive oil with an oil sprayer. 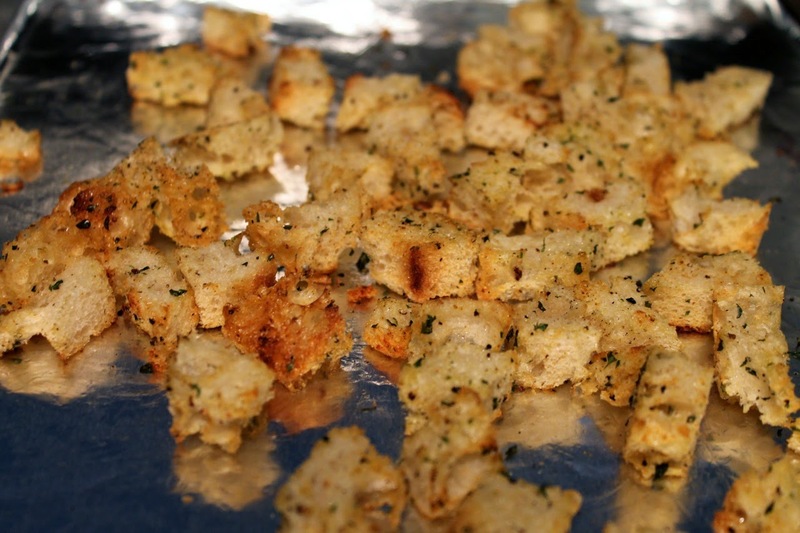 Although store-bought croutons can sometimes taste a little stale, homemade croutons are really good and easy to make. 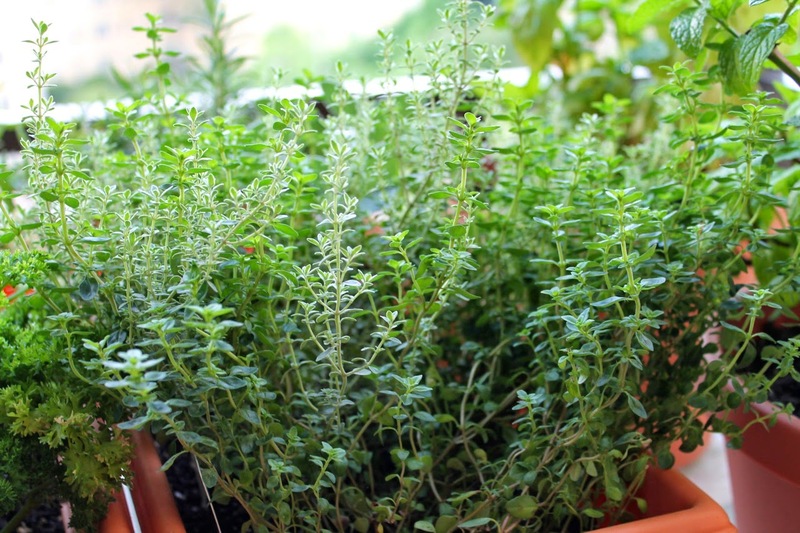 Fresh or dried herbs can be used to season them. This time I used fresh thyme from my herb garden. 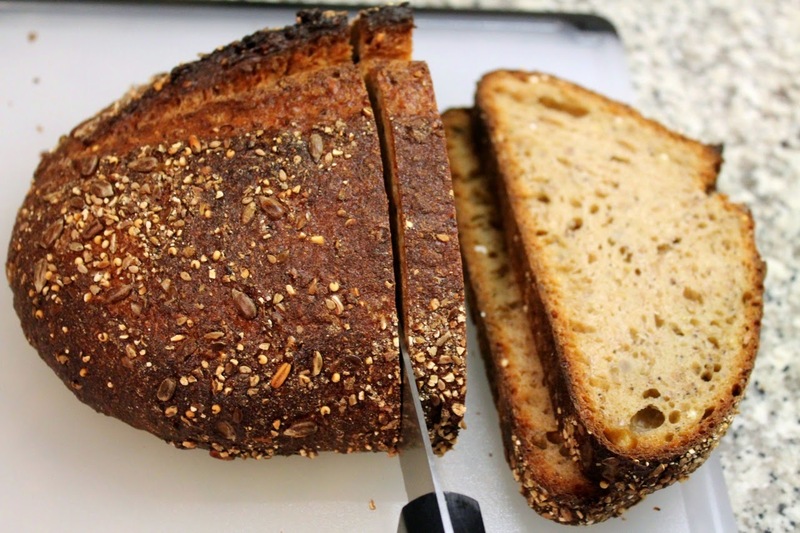 I find garlic powder works better than minced garlic since it adheres better to the oil-coated bread. 2. 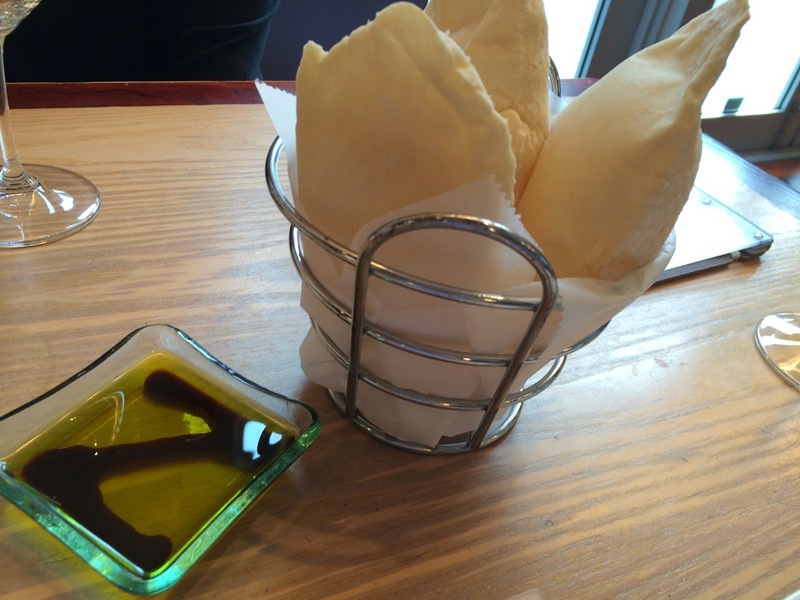 Place bread cubes in a bowl. Drizzle or spray with olive oil and toss to coat. Season with salt, garlic powder and thyme. 3. Spread bread cubes on a baking sheet in an even layer. Bake until lightly browned, about 15 minutes. You'd think I was nuts for wanting more peas after last week's Peas 3-Ways Risotto. 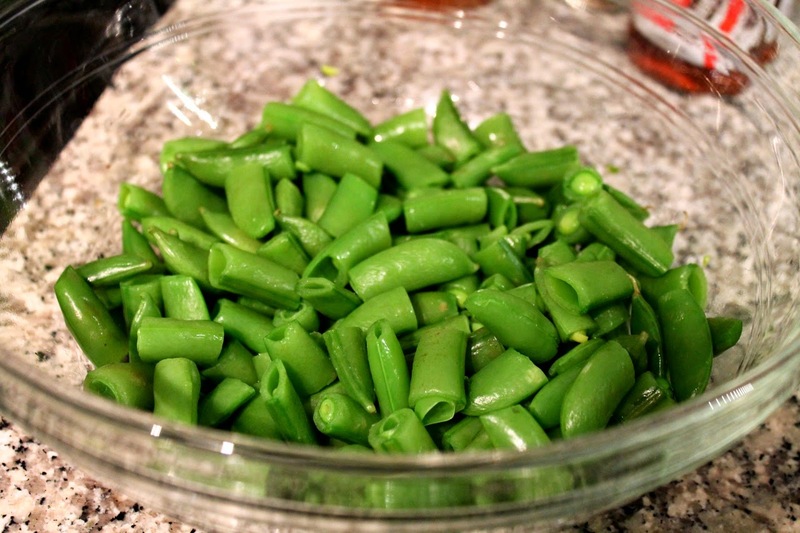 But sugar snap peas are so good right now, so I want to take advantage of them. I decided to use the snap peas as a vegetable "extra" in this chicken and grain dish. I came across Laa Loosh's recipe for Coconut Garlic Chicken looking for a new simple way to prepare chicken. The garlic and tangy coconut sauce give this dish a bit of southeast Asian flair. The sauce from the chicken was a nice complement to the quinoa with snap peas. I also tossed in some mushrooms, thinking of Tom Kha Gai soup, the Thai-style soup with tangy coconut broth that often has chicken and mushrooms. 1. Heat coconut oil in a large frying pan over medium-high heat. Add chicken, season with salt and pepper, and sauté for about 2-3 minutes. 2. Add garlic and vinegar and cook until most of the liquid has evaporated. Add coconut milk, reduce heat to medium, and cook until thickened, about 10 minutes. 3. 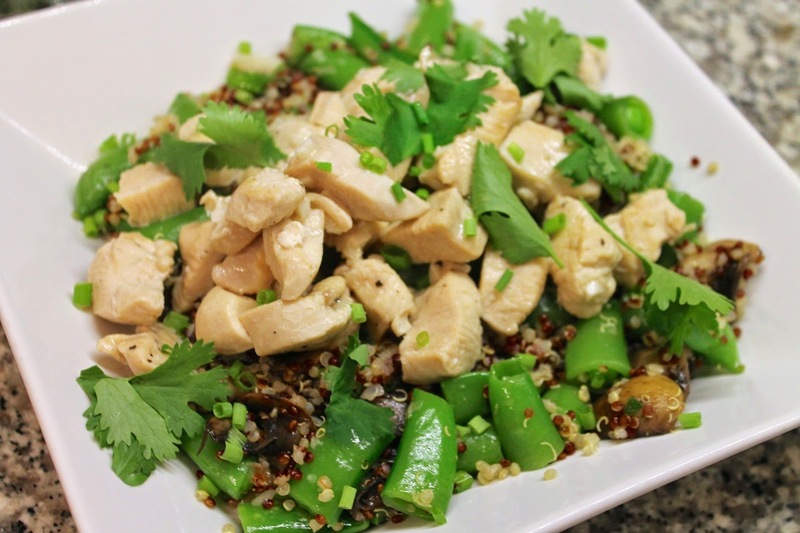 Serve chicken with coconut broth over quinoa with sugar snap peas and mushrooms (recipe below), topped with a sprinkle of fresh cilantro leaves. 1. Heat a medium saucepan over medium-high heat. Add quinoa and toast until the quinoa makes a constant popping sound, about 5 to 7 minutes. Remove from pan. Reduce heat to medium-low. Add 1 tbsp. olive oil and scallions and sauté until softened and lightly browned, about 5 minutes. Increase heat to medium-high, add toasted quinoa and 7/8 cup of water and bring to a simmer. Cover, reduce heat to low, and simmer for 18 minutes. Remove from heat and allow to rest, covered, for another 10 minutes. 2. Bring a large pot of water to boil. Add a pinch of salt and a pinch of turbinado sugar. Add the sugar snap peas and cook for 3 minutes. Remove with a slotted spoon and set aside in a bowl. 3. Heat 1 tbsp. olive oil in a medium frying pan over medium heat. Add mushrooms and sauté until browned, about 10 minutes. 4. 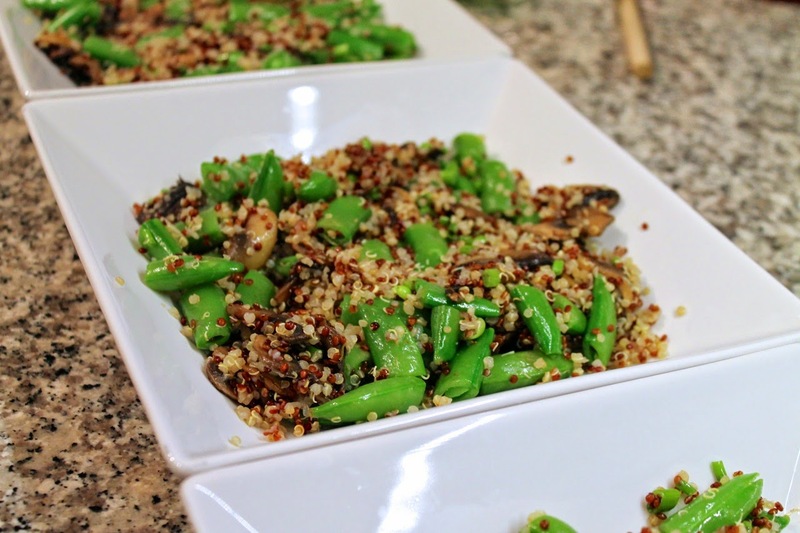 Stir cooked snap peas, sautéed mushrooms, lemon juice and chives into quinoa. Season, to taste, with salt.